Roxann got her first job playing Diana Morales in the Broadway production of A Chorus Line. But fans probably know her best for her role as B'Elanna Torres in Star Trek: Voyager. Voyager offered her the first opportunity to direct and she proceeded to direct 10 episodes of the next Star Trek series, Enterprise. Since then, she’s directed The Deuce, House of Cards, The Americans, The Path, Bates Motel, Crossing Jordan, Lost and many others. She will also be directing the upcoming Morning Show, starring Reese Witherspoon, Steve Carrell, and Jennifer Aniston. She makes her feature film directing debut with Breakthrough, starring Chrissy Metz, Josh Lucas, and Topher Grace, an adaptation of Joyce Smith’s memoir, The Impossible: The Miraculous Story of a Mother’s Faith and Her Child’s Resurrection. 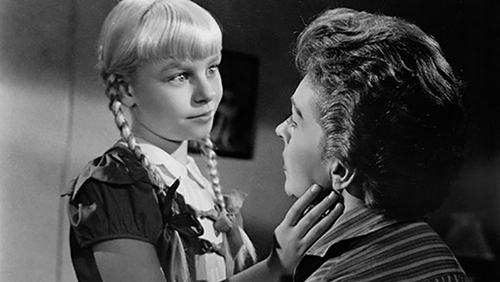 The movie that Roxann has chosen to discuss is, kind of, the exact inverse of her own upcoming film - 1956's The Bad Seed. Maintaining such a prolific acting and directing career, Roxann has so much insight into the craft of acting. She discusses how actors often think that by making "small" acting decisions they are being more authentic, when in reality these decisions are just "lazy" and "boring." She also expresses her belief that the characters in a film should not be discussing the philosophical ideas of the movie, but rather, the film should inspire discussion from the audience. And of course, she talks all about her role as the half-human, half-Klingon, B'Elanna Torres, and what that role has meant not just to fans, but to her personally. You should check out Breakthrough in theaters on April 17. If you haven't seen it yet, go watch The Bad Seed. With April Wolfe and Roxann Dawson.